This Ancient Roman Stage or Theatre known as Teatro Romano in the town of Volterra, Tuscany in Italy, was built in the 1st century B.C. and was originally part of a much larger complex. The ancient Roman stage of the Teatro Romano (Roman Theatre) in Volterra was constructed in the 1st century B.C. and then, in the 4th century A.D. the Roman Baths were built behind the theatre making a much large complex. The scaenae frons is the two tiered background stage where the actors would enter. 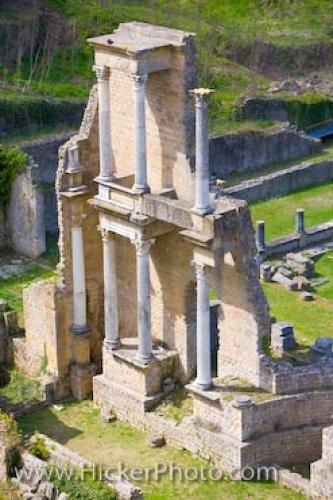 The columns are Carrara marble and even today still look elegant.Ruins of an ancient Roman Theatre (Teatro Romano) dating back to the first century BC in the City of Volterra, Province of Pisa, Region of Tuscany, Italy, Europe.